As Lubbock continues to receive positive rainfall, we are actually moving out of drought conditions according to the USDA Drought Maps. We have received a good portion of rainfall and snow fall in the fall, winter, and spring. The most recent rainfall event was this past Tuesday when we got 0.7 to 1.2 inches of rain throughout town. I am pretty sure that you will not hear anyone in this region complain about rainfall; however, the increased moisture levels and higher humidity than normal has provided a conducive environment for a few diseases to occur. Last year, there were numerous home and commercial lawns that had spring dead spot symptoms on bermudagrass. 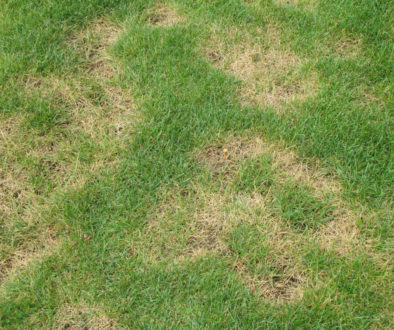 The severity of the disease this spring does not seem to be as bad, but those lawns managed at very low mowing heights or on slopes appear to have spring dead spot symptoms showing up. One of the golf courses in town has a fairway that develops spring dead spot symptoms severely each year. This year was no different for this particular fairway with numerous spring dead spot patches present (Image 1). Additionally, there are weak areas that didn’t develop actual patch symptoms but heavy thinning and necrosis over the entire area (Image 2). Last week, my graduate student and I initiated a plant growth regulator trial at a couple of local golf courses where I observed some interesting symptoms on a creeping bentgrass putting green. The environmental conditions at the time were pretty humid assisting with possible disease development. Additionally, increased irrigation rates had been applied due to the putting greens drying quicker than normal after an application of a product to assist with water penetration into the soil. The symptoms appear to be similar to brown ring patch (Image 5), so samples were collected from the area for isolation and characterization of this possible fungal pathogen (Image 6). I may be able to update this possible new finding in future blog posts as we continue to work on isolating the causal agent. but this made the symptoms much more visible. symptoms were no longer visible in the area. The bermudagrass is continuing to greenup well with no supplemental irrigation to this point. course on a creeping bentgrass putting green that also had annual bluegrass encroachment.